Evernote, the notetaking software program aimed at helping users “remember everything,” has acquired image-sharing app Skitch. Financial terms of the deal have not been disclosed. 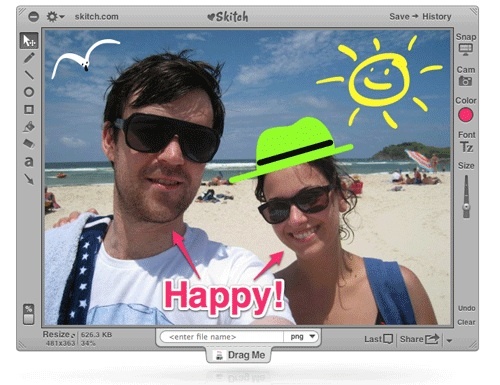 Skitch is a Mac application that enables easy image editing and sharing. Skitch, which had previously cost $19.99 in the Mac App store (s AAPL), will now be completely free and will soon be expanded to “to every desktop and mobile platform under the sun,” Evernote said. The first Skitch Android (s GOOG) app was launched Thursday just after the acquisition deal was announced. For years, one of our most requested feature areas has been related to improved handling of images and annotation capabilities. Our users take and share millions of photos and screenshots already, but the experience isn’t as good as it could be. We debated about whether to add the improved functionality into Evernote or build a separate app to handle it. Finally, we decided to do both. Thanks to Skitch, we will. Evernote has been growing at a rapid clip recently. Last month, the company closed on a whopping $50 million in new venture capital funding to further fuel its growth. And according to a speech made this morning by CEO Phil Libin, the company now has more than 12.5 million users, some 200 percent more than the 3.9 million users it had a year ago. Nearly 570,000 of those are premium paying users, a 500 percent boost from last year.